Ross County have given Kilmarnock defender Martyn Corrigan a signing deadline of next week having already secured Falkirk striker John Stewart. The First Division club have also extended the contracts of midfielder Martin Scott and defender Scott Boyd. But manager Derek Adams is demanding an answer from Corrigan, who has hesitated on the move for family reasons. "We are still trying to work on a deal for Martyn. The stumbling block is trying to get him here," said Adams. "Martyn has seen around the stadium and the facilities and I will make a decision on him next week." 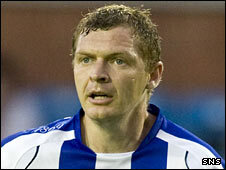 Corrigan has made just 10 appearances for Killie since arriving from Motherwell a year ago. He has played once for the Scottish Premier League outfit's first-team this season, a 3-0 defeat by Celtic in November. But County fear they will fail in their attempts to sign the out-of-favour 31-year-old because of Dingwall's geographical isolation. Stewart, 23, was signed in time to make his debut in Saturday's 1-0 victory over Queen of the South. Adams was pleased to have secured the services of Boyd and Scott until summer 2010. "They are good players," said the manager. "I played with both of them at Livingston. They are only 22 and they have good futures."